Facts and information about the History of Clothing of Native American Indians and their Fur Parkas. 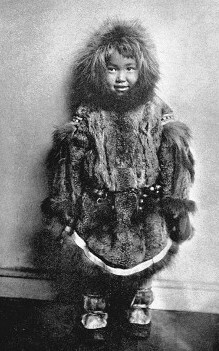 Fur Parkas were the traditional clothing that were developed and used by the Inuit tribe and worn by many other tribes such as the Yupik who inhabited the Artic regions of Alaska and in Canada. The Parka is one of the most effective cold weather clothing styles ever developed. One of the major elements used by many of the Arctic tribes was the addition of a fur ruff that was attached to the hood, hem, and cuffs of their parkas. The natural resources used to make fur parkas were superior to many modern synthetic materials and provided excellent insulation against bitter, cold weather conditions. Parka Definition: A parka is a knee-length cold weather hooded coat that was originally worn in the Arctic, made from animal skin and often stuffed with down and fu on the inside and trimmed with fur around the hood, cuffs and hem.